Are you in the market for new work vans for sale but are just not sure where to begin searching? Let Ewald Chevrolet Buick be your only stop for your next work van for sale. We are here to help you find the perfect Chevy work vans for sale to suit your business needs. We are proud to serve Oconomowoc, Milwaukee, and the neighboring Wisconsin communities with a great selection of Chevy work vans for sale. At Ewald Chevrolet Buick, we understand that the decision to find the right Chevy work van can be a hard choice. Like many business owners in Milwaukee WI, you are planning on keeping your Chevy van many years and want it to fit your needs now as well as in the future. We also know that not every business has the same requirements when it comes to their new Chevy work van. That is why Ewald’s near Milwaukee WI Chevy dealer is here to help find the perfect Chevy work vans for sale for you and your business needs. Our Ewald near Milwaukee WI Chevy dealer sales team makes it their top priority to help you determine which new Chevy Express van for sale will suit your business needs best. Whether it is the Chevrolet City Express, the Chevrolet Express Cargo Van, or the Chevrolet Express Cutaway, we have the Chevy work vans for sale that are ready to work for you. If you are looking for the customization of a Chevrolet Express Cutaway, the possibilities are almost limitless. Like the new 2018 Chevrolet Express Commercial Cutaway 3500 Van for sale. 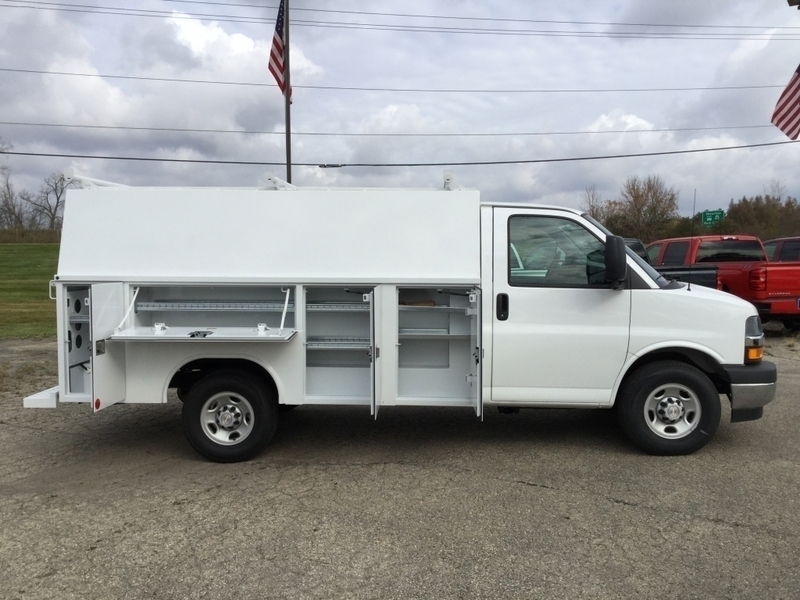 This Chevrolet Express Cutaway van for sale has a commercial upshift/shelving unit with lockable compartments to keep all of your work tools and other belongings safe. The 6.0-liter engine has enough power to make the task of hauling heavy loads easy. Whether you are a painter, carpenter, or another type of contractor, you can count on one of our new Chevy Express Cutaway Vans for sale to help you get the job done. Do you need to know the value of your current vehicle you are driving and considering trading in on one of the Chevy Express work vans for sale? Let the experienced sales team at Ewald Chevrolet Buick help you out with that too. We take in all kinds of trades here at your Ewald near Milwaukee WI Chevy dealer. Including other major vehicle brands like Ford, Ram, and much more. Have your Ewald Chevrolet Buick sales team professional get your current vehicle appraised once you make your selection of new Chevy work van for sale today. At Ewald Chevrolet Buick, we aim to provide you with the best buying experience possible for your next Chevy work truck, so make the drive to Oconomowoc WI today. You can reach Ewald’s Wisconsin truck dealership at (262) 226-2842 to schedule your test drive. Or find Ewald Chevrolet Buick at 36833 E Wisconsin Ave in Oconomowoc WI, 53066.